Recently, i have gradually been more and more invovle on "Green IT" topics and related projects (the extact term is : "to be caught up in the system"). 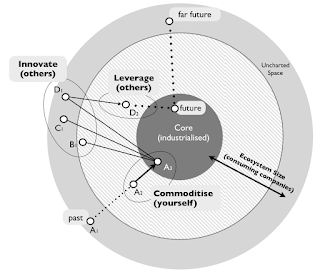 I realized that the current strategy applied by company is mainly capability driven, to put it into simple word it means: doing more with the same amount or less resources (think virtualization). The main metrics for those efforts is TCO reduction and actual environmental impact is just a side effect and used for "green washing" the company strategy. On top of that, I have yet to see the actual numbers for postive environmental impact of such strategy. Company are claiming millions in savings, however, where are those million going? They are reinvested in non sustainable related effort. 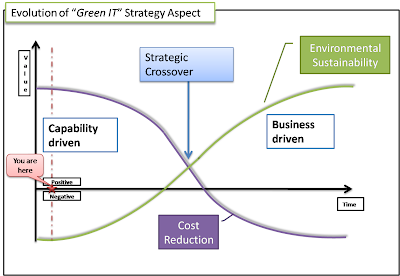 The following graph depicts my opinion of the actual sustainable IT strategy taken by many company. Currently going green means reducing TCO. But since most of the money saved is reinvested in non environmental related projects. There is actually no real effort toward environmental sustainability. However, these “cheap and green” solutions for TCO will soon be exhausted and company will actually need to spend money to maintain their environmentally friendly masquerade. This will in return reverse the trends, the TCO will rise because they want to be “green” and finally (hopefully) will generate a positive ecological impact. 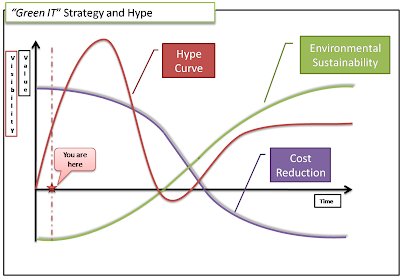 What I want to demonstrate is the risk created by the current hype to environmental strategy within companies and more particularly to the critical section: switching from capability to business driven strategy. It will coincide with the "Trough of Disillusionment" . At this stage the technologies fail to meet expectations and quickly become unfashionable. Consequently, the press usually abandons the topic and the technology. And when the press lose interest so do the board members and share holders. This abandonment will be accelerated with the rising costs to maintain the environmentally friendly masque . As consequences there is a high probability that companies will never crossover toward providing actual sustainable environmental solutions. The only things that will force them will probably come from public and political pressure due to ecological issue (not mentionning catastrophic ecological event). I hope I’m wrong, but company are not a person. They have no social or ethic responsibility per se. And when you look at the result from Robert Hare, a University of British Columbia Psychology Professor and FBI consultant, which used diagnostic criteria from the DSM-IV to analyse the "personality" of the corporate "person". In his finding he compares the profile of the modern, profit-driven corporation to that of a clinically-diagnosed psychopath.